We are in the midst of a cybersecurity epidemic. In the last year, hackers have unleashed the WannaCry exploit that crippled National Health Service hospitals and facilities in the United Kingdom; they obtained the voting information of 198 million US citizens and held thousands of users’ personal information hostage by exploiting a vulnerability in Windows. But today is where we draw the line: an anonymous group of hackers have just leaked episodes of Ballers, Room 104 and, worst of all, the script for next week’s episode of Game of Thrones. 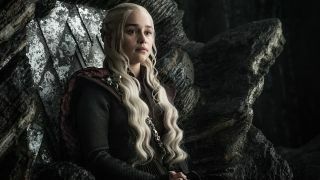 The report of the hack comes from Entertainment Weekly, who says that the leakers got their hands on over 1.5TB of data from HBO’s internal servers. According to the hackers themselves, however, they’re just getting started and have alluded to the fact that they might have obtained full episodes of future Season 7 Game of Thrones episodes. "Hi to all mankind. The greatest leak of cyber space [sic] era is happening," an anonymous email sent to the EW reporters on Sunday said. "Hi to all mankind. The greatest leak of cyber space [sic] era is happening." "What's its name? Oh I forget [sic] to tell. Its [sic] HBO and Game of Thrones......!!!!!! You are lucky to be the first pioneers to witness and download the leak. Enjoy it & spread the words. Whoever spreads well [sic], wi [sic] will have an interview with him. HBO is failing." HBO is failing in its ability to provide reasonably priced content, sure, but if we hacked every media company that overcharged us (cough, Apple iTunes) we’d never have time to actually watch all these great shows. “As most of you have probably heard by now, there has been a cyber incident directed at the company which has resulted in some stolen proprietary information, including some of our programming,” HBO chairman and CEO Richard Plepler wrote in response to the hack. An episode of Ballers also hit the web early. OK, we’re having a bit of fun at the expense of some rather unfortunate news. But hacking is, very clearly, a big deal and not something to be taken lightly. HBO joins companies like Netflix and Sony, both of whom have suffered major leaks within the last few years that cost the companies financially. Hacking clearly presents ethical danger to society (hacks are a breach of privacy) and makes us all feel less secure online – which is not a good thing considering we all love this place and want to be here. For now, it looks like the hackers might have won. But, like Cersei Lannister, HBO is a powerful entity. And if this week's episode taught us anything, it's that Lannisters always pay their debts.